MacGregor has launched a new crane compensation system for offshore ship-to-ship load transfers, offering substantially larger operating windows as well as safer and faster load transfers. “This robustly-tested technology can offer considerable commercial advantages to the offshore industry,” says Ivar Fjermeros, Senior Sales Manager, Advanced Offshore Solutions. “MacGregor understands the complexity of ship-to-ship load transfers and the limitations imposed by unpredictable, non-synchronised movements in a seaway. With the systems currently available, a crane’s capacity is effectively de-rated because of the conservative approach required to minimise risks associated with the relative movements of the vessels. The new compensation system employs a motion reference unit on the deck of the secondary vessel. 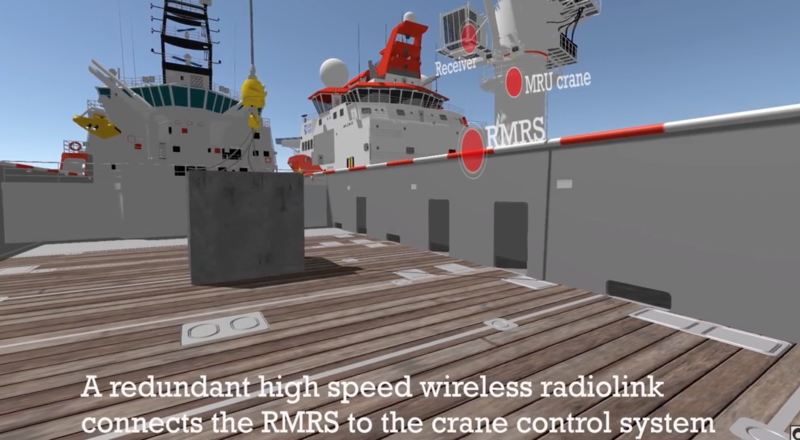 This transmits motion data to the crane on the primary vessel via a high-speed redundant wireless link. Combining motion data from both vessels, the system calculates and applies the winch compensation necessary to minimise hook movement at the load-handling zone on the secondary vessel. The system features precise tension and position control for accurate load hook-on, pick-up landing and hook-off. Safety is much improved for the deck crew working in the load-handling zone. Load pick-up and landing is precise, fast and smooth. It allows the operator to employ a less conservative approach to calculating the maximum load that can be safely handled in any given sea state. For owners with existing MacGregor offshore cranes wishing to benefit from this new system, it can be retrofitted cost-effectively and can be used with other MacGregor crane advances.